The survey also highlighted big sector and regional rotations (see first chart). The US election outcome accelerated rotation into Banks, out of high dividend yield and bond proxies such as Utilities and Telcos. It also spurred the buying of US equities, selling of Tech and Emerging Markets (the biggest monthly drop since February 2011). 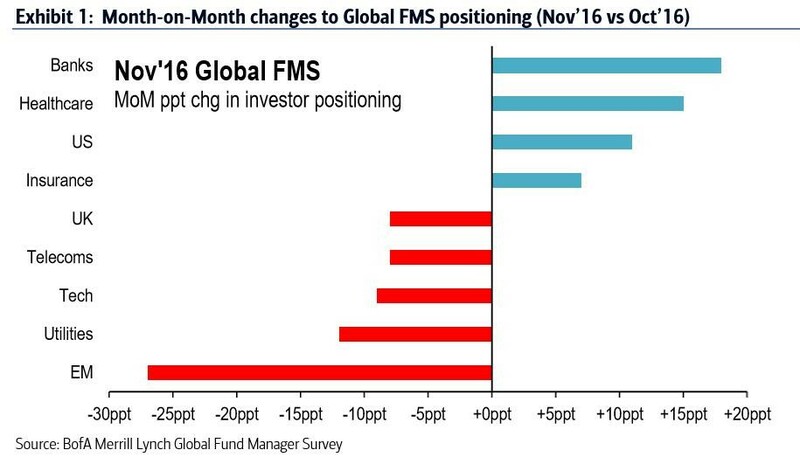 The survey also showed a growing conviction in “inflation trades”, with a majority of investors expecting cyclical rotation to continue “well into 2017”. Investors are the most optimistic about corporate profit expectations in 15 months (see second chart). 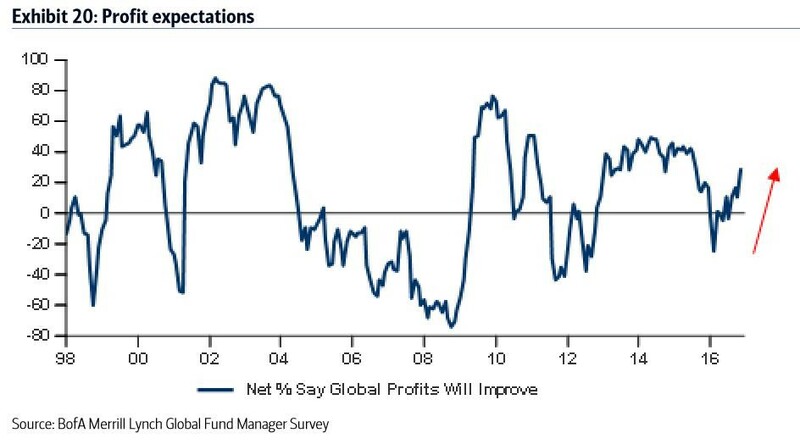 A net 29% think global profits will improve over the next 12 months (up from a net 10% a month earlier). The biggest tail risk is seen as a “stagflationary bond crash”. Any political rhetoric that calmed protectionism fears (which jumped to the highest level since 2009) would boost risk appetite. The most crowded long positions (high quality/low volatility stocks, US/EU corporate bonds and Emerging Market debt) remain vulnerable to any further rises in yields. In terms of contrarian trades, survey participants viewed being long UK assets as unambiguously contrarian, with the GBP being viewed as the most “undervalued” on record. Investors expect that there will likely be a trade in “bond proxies” soon, but that the cyclical view of peak liquidity means that the “yield” dam has been broken. Survey participants also expect that the market share of passive investment strategies will rise to 40-49% of all equities under management within 3 years. BofAML’s strategists note that the big drop in cash weightings in November is not yet a tactical negative, but a drop in cash to less than 4.8% in December would be (as a 1 percentage point fall in two months historically causes risk sell-off). However, the rotation from bonds and cash to stocks is probably not fully spent as asset allocators still have plenty of room left to raise equity weightings in coming quarters.